Ireland’s situation on the periphery of western Europe is sometimes seen as isolating it from lierary and intellectual developments during the eighteenth century. An examination of Irish private libraries and the book trade which supplied them shows instead an Irish readership au fait with Continental trends in literature, the sciences, politics and the arts. This study concentrates on French language works circulating in the country through the use of booksellers’ and auction catalogues, book reviews and advertising. An exploration of the ownership of French language works points to an interested audience at different social levels and across the religious divides. Dublin dominated the Irish trade in French-language books, its major booksellers importing stock from London and European publishing centres and distributing books and periodicals wholesale and by catalogue to the larger Irish cities and towns. Domestic publication in French also occured in Dublin, Cork and Belfast. The provincial cities too had a role to play in the distribution of French-language material, opening up new markets in the smaller towns, using regional newspaper advertising and selling by catalogue. Questions of literacy and readership are explored, with particular emphasis on the teaching of French, indentifying teachers and schools throughout the country. The huguenot contribution is outlined, especially their role in the publication of French-language books in the first half of the century. Many Catholics received their education in Francophone countries, returning to Ireland with advanced French language skills. In elite circles the French language was a fashionable accomplishment. 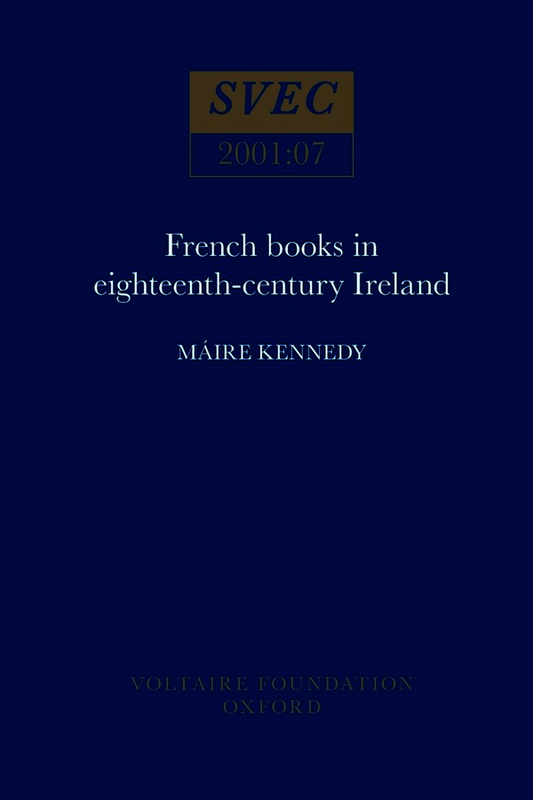 This works draws on comparable studies in Britain, France and Germany to place Irish readership of French-language materials in the broader context. The picture that emerges shows Irish readers as active participants in the cosmopolitan culture which flourished in eighteenth-century Europe.